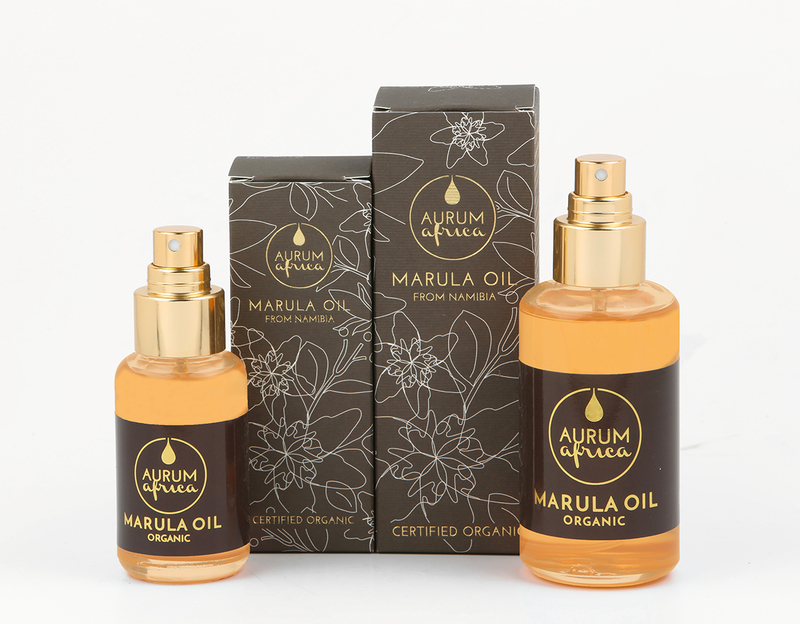 Marula Oil Aurum Africa, 100% natural and organic, comes from collection and environmentally sustainable processing of the wild Marula tree kernels in Namibia. The nuts are hand crushed by rural communities. Extracted in purity with a cold pressing process our Marula Oil is naturally filtered to avoid the presence of molds and yeasts and to ensure the product quality and stability. Our Marula Oil has a golden color and it is naturally odorless. It meets the standards imposed by the international cosmetics industry and the UE legislation. It is deposit and bacteria free. Microbiologically tested by the Cosmetology Centre of the University of Ferrara-Italy. A precious oil for your skin care routine! The Marula Oil contains high levels of important antioxidants including vitamin C, vitamin E, amino acids and flavonoids, natural allies for the treatments of face and body skin as they contribute to the cells regeneration and to fight the damaging effects caused by atmospheric agents. The regular use of Marula Oil provides an advanced protection against photo-aging, neutralizes free radicals, helps to build healthy collagen and provides antioxidant protection. The Marula Oil is also rich in essential fatty acids, Omega 6 and Omega 9, which deeply nourish and moisturize the skin and improve its elasticity and smoothness. Easily absorbed, it supports the natural accumulation of lipid layers and possesses anti-inflammatory properties by reducing any redness. The Marula Oil can be used day and night as a source of nutrition and antioxidant energy for the skin cells. It is ideal for all skin types both greasy and dry and it is also useful for those sensitive and/or damaged by incorrect and too long sun exposure. It reduces the appearance of fine line and wrinkles, improves and restores the elasticity of the skin making it brighter. The presence of vitamin E also allows the production of collagen and elastin which increase skin tone, density and compactness. The Marula Oil contains a large percentage of monounsaturated fatty acids and natural antioxidants. Mono unsaturated fatty acids: oleic acid ( 70-78 % ). Polyunsaturated fatty acids: linoleic acid (4.0-7.0 % ), alpha-linoleic acid 0,1-0,7 %). Saturated fatty acids: palmitic acid (9-12 % ), stearic acid (5.0-8.0 % ) and arachidonic acid (0,3-0,7 % ). It also contains tocopherols (vitamin E), sterols and flavonoids with antioxidant action, procyanidins, catechins and galattotannins.